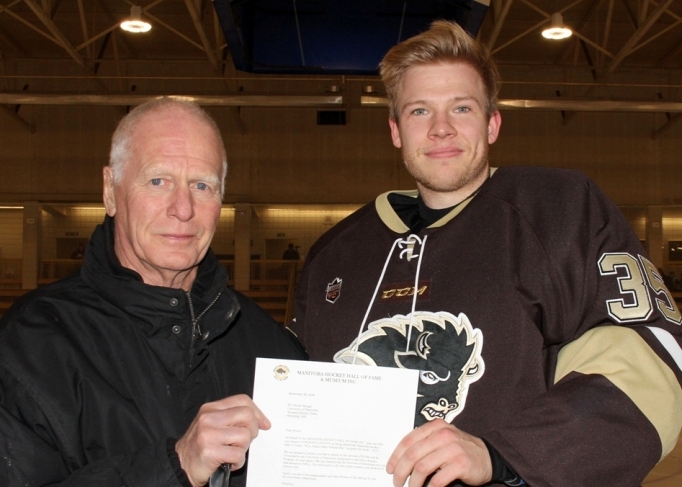 Manitoba Hockey Hall of Fame President Don Kuryk presented University of Manitoba Bisons goaltender Byron Spriggs a $1500 Sam Fabro scholarship at a recent home game. A former member of the Manitoba Junior Hockey League Winnipeg Blues, Byron is in his 5th year with the Bisons. The R. A. "Sam" Fabro Scholarships are awarded to a member of the University of Manitoba Men's and Women's hockey programs. The recipients are selected by the UofM coaches every November from their respective rosters. Born in Udine, Italy, Sam Fabro moved to Winnipeg as a child and played with the 1941 Memorial Cup winning Winnipeg Rangers. He was one of the founders and first Chairman of the Manitoba Hockey Players Foundation in 1967 and was a leader in the creation of the Hockey Hall of Fame & Museum in 1985. Fabro was also a huge influence and instrumental builder in more than just hockey. The Chair of the 1974 Winter and 1978 Summer Games, Fabro was a co-founder of the Manitoba Marathon and Canoeathon and Chair of the Manitoba Sports Hall of Fame. He was President of the Manitoba Baseball Association from 1968 - 1969, Chairman for the Manitoba Games from 1974 - 1978, and vice chairman of the Wildlife Foundation of Manitoba. He was admitted to the Order of Canada in 1975. Ronald A. "Sam" Fabro passed away January 2, 2018.